Meet Roy, a member of Lemberg’s data communications team who enjoys building relationships on the job. We visited Roy on a local jobsite to talk about his work and about the importance of fitting your interests to your career choice. Working side-by-side with one of Lemberg's electrical construction teams, Roy and his data communication team were pulling network cable to connect a new addition to an existing section of an assisted living center. This type of collaboration was common from the bidding process through job completion and offers Lemberg's clients “a complete and one-stop job.” Roy talked a little about the challenges of this kind of mixed new construction-existing building job. “Things are definitely easier in new construction because the studs are exposed,” he explained, as he led us quietly and as inconspicuously as possible through the home to a newly decked network closet. There, he pointed out the way he and his team had neatly tucked cabling to a series of pathways and panels. His pride was evident and the end product will undoubtedly please the client. Roy is proud of the relationship-building he does while on the job and notes that clients will ask for him by name. Whether that is with the IT department of the end client or a general contractor, it seems Roy is making a name for himself through his attentiveness and quality. Roy shared how he came to work with the Data Communications team at Lemberg. With an interest in computers, he began in college studying computer programming but wasn’t thrilled about a future behind a desk. He knew he would enjoy work with more on-the-job problem-solving. Even so, he was apprehensive when a friend suggested he join the Lemberg team. That was twelve years ago. Today, Roy enjoys running jobs for Lemberg and looks back on the decision that he now knows was right for him. We asked Roy what advice he might have for a new generation of high school graduates considering the data communications or electrical trade. He said that the fields of electrical and data communication have lots of potential for growth and individuals have the ability to earn a good wage earlier in their career. For Roy, it’s the project-based variety and collaboration among trades on the job that keep the work interesting. It’s those last two that help move a new technician up through the professional levels of the trade and on toward success. Lemberg is a full-service Milwaukee sign, electric and data communications company, proudly serving Wisconsin. Contact our experts for a free quote today, 262-781-1500. 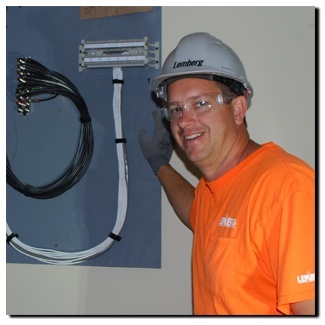 Founded in 1928, Lemberg specializes in 24-hour electrical service, signage, data communications, energy management and electrical construction. 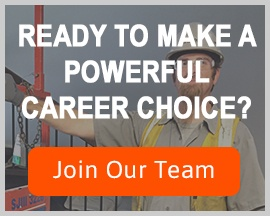 With more 90 years of experience, Lemberg is recognized as one of the area’s largest employee-owned organizations for complete solutions with a focus on quality, collaborative service and the latest technology. © 2019 Lemberg Electric Company, Inc.